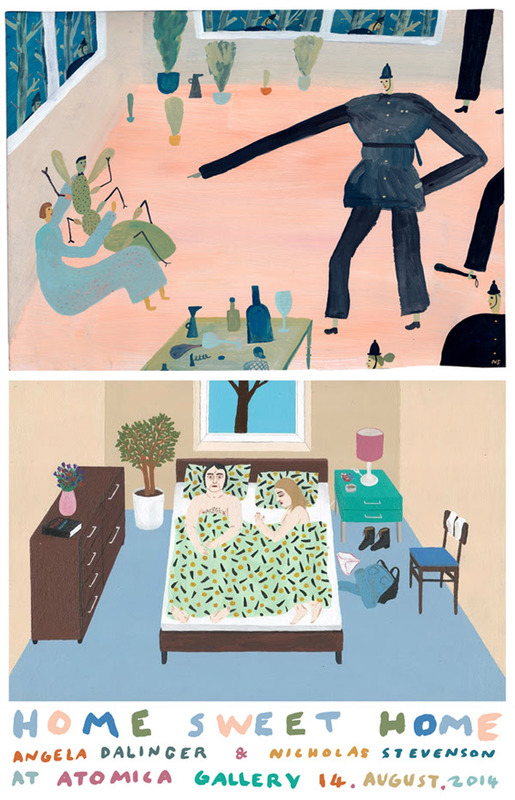 ‘Home Sweet Home’ is a joint exhibition of new paintings from Nicholas Stevenson (UK) and Angela Dalinger (Germany). ‘Home Sweet Home’ offers a snatched glimpse into a series of imaginary homes. In the exhibition both artists indulge in depicting domestic voyeurism which treads a thin line between the whimsical and the worrying. As we trespass through these residences, we are likely to encounter anything from illegal pets to resident ghosts, wizard’s gardens to troubling personal collections and questionable tastes in decor. The artists, who are virtual friends and will meet for the first time at the exhibition opening, have worked on their paintings individually, but in reaction to the others work. Presented as a series of paired paintings, the viewer will be taken on a journey through both the interior and exterior of the same invented dwelling, each scene produced by a different artist. Indulging our curious natures, the paintings in ‘Home Sweet Home’ portray private moments in which viewers may pass unnoticed and draw their own conclusions. The artists share a cynical sense of humour and their vision of the world is at once familiar and disturbing, quaint and brutal. Hailing from a small village on the edge of Hamburg, Germany, Angela Dalinger is an artist who identifies with the Art Brut movement. Her seemingly naive style is absent of current cultural or artistic influences, something her relative isolation no doubt has a hand in. Angela works at a prolific rate and has taken part in numerous group and solo exhibitions around the world including France, Belgium, Portugal, Denmark, Spain and the US. Nicholas Stevenson is an illustrator, artist and musician currently based in North London. His chalky gouache paintings are lively, mysterious and occasionally unsettling. His work has appeared in the likes of The New York Times and Anorak Magazine, he has exhibited in group shows around London and had a successful debut UK solo show in 2011. He is the recent winner of the 2014 Serco Prize and his work is the featured cover art for the Belly Kids book, Thrill Murray. Join us for the ‘Home Sweet Home’ opening reception on Thursday 14th August, 6-9pm! RSVP to rsvp@atomicagallery.com or join the Facebook event.